Where are we with the RFP? This is perhaps the most common question asked of team members and SMEs contributing to a request for proposal. I was a product manager for nearly a decade, and during that time I responded to countless RFPs manually. About 30% of my time was spent responding to RFPs, so I lived many of the same inefficiencies our clients experience in the field. Inevitably, the question would be asked: Where are we with the RFP? There was no easy answer to this, because everybody was being kept in the dark. As an SME, I felt frustrated because RFP response wasn’t my primary job responsibility. When it was time to contribute to an RFP, I had to drop everything to complete the task. Sales was equally frustrated with the process. RFP responses are their bread and butter, so of course there is a sense of urgency. They didn’t know if I was on vacation—and if an RFP came in while I was out, they would be left hanging and potentially miss out on a new business opportunity. To overcome these RFP process hiccups, companies will have standup meetings or send regular email updates to stay on top of project completion progress and make sure the deadline will be met. This works to a certain extent, but it requires more time and effort than most teams can spare. This is where an RFP management dashboard comes in, alleviating common challenges with the analytics, insights, and reporting capabilities your team has been waiting for. What is an RFP Response Management Dashboard? A manual approach to RFPs keeps teams guessing throughout the entire lifecycle of an RFP project. Grasping the progress of an RFP response is extremely limited when communication is happening by email and the project is viewed in spreadsheets. An RFP response management dashboard takes guesswork out of the workflow by providing insights at-a-glance. The proposal lead can have full visibility into the project, knowing exactly where everything stands. Knowing an RFP project’s status is just scratching the surface when it comes to available insights within a dashboard. There are several types of RFP response management dashboards that bring teams visibility they didn’t even think was possible before with a manual RFP process. Every RFP management solution is different, but the most robust technology will offer dashboards. RFPIO has multiple dashboards that teams can use to support their RFP response efforts. Response Dashboard – Wonder how many responses are complied or supported for a yes/no answer? Sales would be curious to know—and this could be a dealbreaker. If 90 out of a 100 questions are a “no,” then what’s the point in bidding for it? These insights give you a sneak peek into the process. Answer Library Dashboard – Content audits are necessary for overall RFP response quality. Here, admins can assign content owners and set up automatic reminders to notify when it’s time to refresh the answer library, based on the audit frequency you choose. 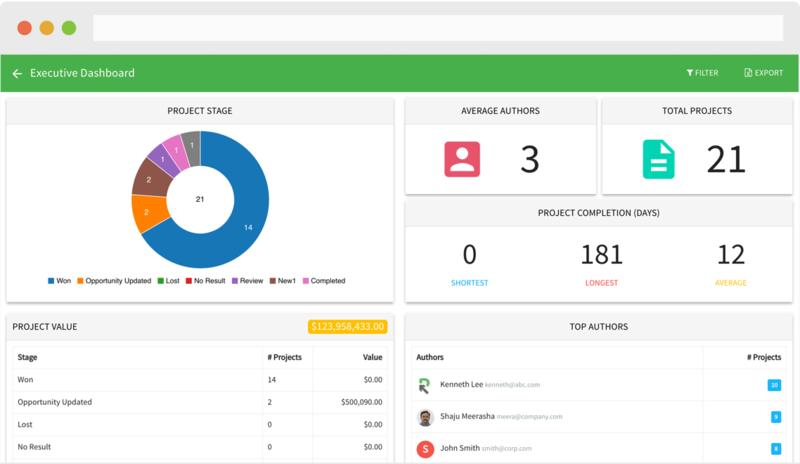 RFP response management dashboards will grant you visibility into the entire process to save your team hours. The great unknown of RFP response will be eliminated with this level of analytics and reporting. Regular status meetings and emails will become obsolete when you can simply view the dashboard and know on the spot. If you assign 50 questions to your SME and he has completed 28, he feels more confident being able to track his progress. You will also feel more confident, knowing your SME is working to meet the deadline. If another SME skips a few questions, you will be able to recognize the oversight and nudge them to finish their assigned responses. This is clearly better than when you used to submit an RFP without knowing RFP responses were missed, then losing an opportunity because the vendor thought you dropped the ball. 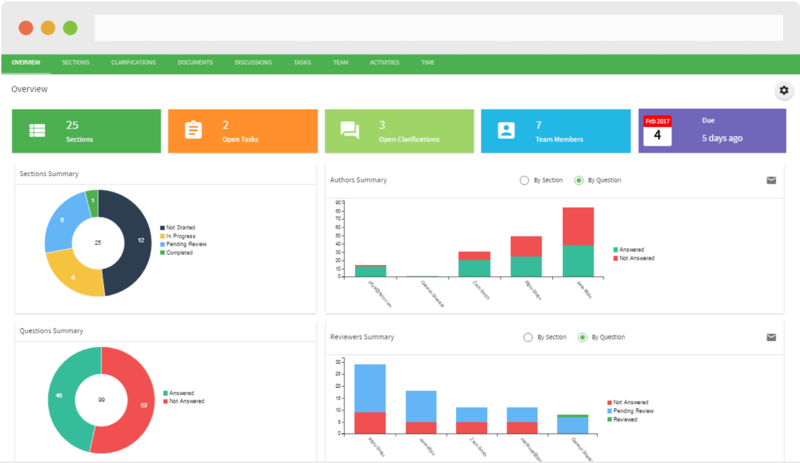 For executive and sales teams, some dashboards can be viewed directly in their CRM. This brings quick insights to the table, without the extra step of logging into a separate platform. Being able to view the RFP response project in the tool they use daily will limit questions and provide real-time access. Contributor recognition is another important benefit of RFP response dashboards. With smaller teams, it’s obvious when someone is contributing—but with larger teams, it can be more challenging. Being able to recognize your key RFP contributors and incentivize for more participation will encourage your team. This internal motivation will ultimately drive more revenue, since your organization will be enthusiastic to contribute to the next RFP. Your team’s potential becomes limitless when you have RFP dashboards incorporated into your workflow. Start giving your organization full visibility into the response process by using RFP software.